There are many reasons why I might decide to make a particular dish: a drool-inducing photo, a particularly tantalizing recipe title, a glowing review, or the mere presence of cilantro and lime. Sometimes, though, I want to try my hand at a recipe simply because it strikes me as a challenge. These challenge recipes tend to fall into two distinct categories: extremely labor intensive, or mildly stomach-turning (I've got my eye on a mussel custard). When I saw the long, intricately detailed recipe for croissants in Martha Stewart's Baking Handbook, I knew I had to try them. I've never been a huge croissant fan (when it comes to breakfast breads, I am all about the bagels), but how could I pass up three days of rolling, folding, and baking? Well, I wish I could say that it was a complete success. The final product was tasty, but I made a couple of mistakes along the way. First, I let my dough rise too long in the fridge. When I took it out to begin day two, it had begun to escape its plastic wrappings. On the positive side, I knew my yeast was fresh. My second mistake resulted from some miscommunication between me and Martha (ok, I misunderstood the directions). After completing all of the folding and rolling, the recipe told me to cut my rectangle in half and stack the two pieces, then cut out the triangles. I missed the part about separating the triangles into two layers, so I ended up with croissants that were twice as thick as they should have been. This, combined with my over-risen dough, left me with somewhat tough croissants. They had that signature croissant flavor (some may call it butter), but there were not as airy as I would have liked. 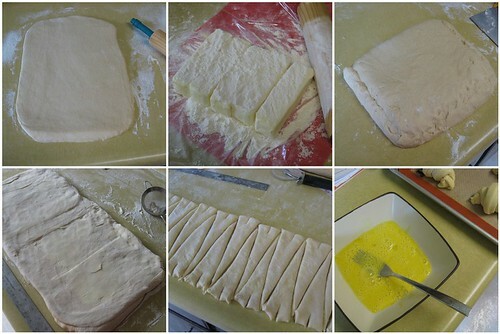 Being the perfectionist that I am (those rookie mistakes haunt me), I will try making croissants again. 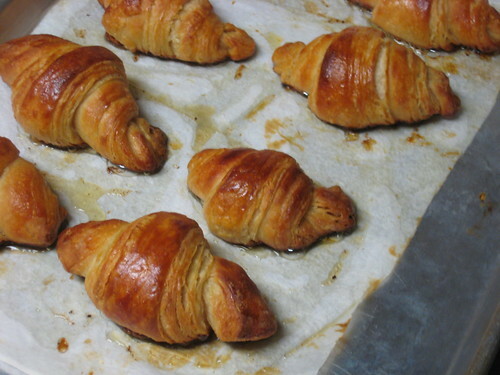 If you would like to try your hand at making croissants, Martha has a different recipe on her website. The directions look even more in depth than those in the cookbook, so I may try that one next time. I am also eyeing the recipe in my giant (and awesome) Gourmet Cookbook. If you have a croissant recipe that you adore or any tips that you would like to share, I would love to read about them in the comments.